Still, Meyers showed how not everyone (and certainly not anyone who is currently president) has the good sense to refrain from waxing rhapsodic about a hurricane, especially when you take time out of your praise of the brave people of the Coast Guard to talk about how the Guard’s incessant rescue efforts during Irma are great for “re-branding.” (That’s sort of their brand, rescuing people. It’s working out quite well.) 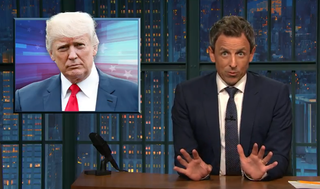 But Meyers’ perfect storm of criticism of the media and of Trump came together when his “A Closer Look” segment examined how pundits are currently rushing to graft some sort of coherent interpretation onto Trump’s recent deal with Democratic lawmakers over raising the debt ceiling.